Copeland Creative agrees to produce copy and content for written materials (the “Work”) on a per-project basis, at the request of the Client for fees agreed upon in advance and to deliver the Work by an agreed deadline. Each Project that Copeland Creative undertakes will be subject to a written quotation and/or proposal. Quotations and proposals are provided on the understanding of the project, and on the basis that the scope of the work does not change during the course of the project. In the event that it does, Copeland Creative will discuss any potential changes in costs in advance of carrying out the Work to which the new charges relate. A written confirmation that you are commissioning Copeland Creative to write for you, and that you agree to the quoted fee, will be required before any work is undertaken. 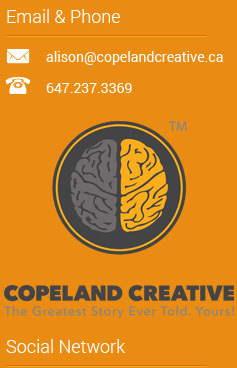 If you are hiring Copeland Creative to work for you on behalf of any organization, company or group of individuals other than yourself alone, you will confirm that you are authorized to hire Copeland Creative on their behalf, before any work is started on your project. Copeland Creative will make every effort to ensure that the Work is free of errors and omissions, including errors in spelling and content, but cannot warrant this. The Client has ultimate responsibility to review the Work thoroughly before committing the Work to production, and the Client is ultimately responsible for the content of the Work and any costs incurred as a result of the appearance of any errors in the final published form of the Work, whether or not those errors appeared in any draft of the Work completed by Copeland Creative. It is the sole responsibility of the Client to ensure that all statements, claims, promises, information on products or services, and guarantees are upheld in accordance with Canadian law. No claim for compensation due to loss of earnings or any other detrimental effect to your business can be made to Copeland Creative. Copeland Creative retains copyright of any materials it supplies until the final payment is made in full. Unless the Client expressly prohibits it, Copeland Creative reserves the right to use excerpts of the Project on the copelandcreative.ca website and portfolio. Any excerpts used will be accompanied by a credit and/or link to the Client or third-party client’s website. By using this Website, you acknowledge that any product, process or technology comprised or described in this Website may be the subject of other intellectual property rights that are reserved by Copeland Creative and are not licensed hereunder. The rights to all trade names, trademarks, logos or other expressions of brand identity of Copeland Creative are expressly reserved hereby. Trademarks of other parties are identified wherever possible and Copeland Creative acknowledges their rights. Copeland Creative prefers to charge a project or flat rate to cover all services from start to finish. In the case of a project or flat rate (unless stated otherwise) the fee will include any time spent in meetings, telephone or email conversations to discuss the brief, research, planning, writing and submission of the first draft, discussion, evaluation and integration of up to two sets of revisions and submission of the final draft. Revisions requested after the third and final draft is submitted may incur an additional fee. A 50% deposit will be requested on commission of any project exceeding $401. Work up to the value of $400 requires prepayment in full. The final invoice will be sent when the Client approves the final draft of the Project. All payments must be made within 14 days of the date shown on the invoice. If payment is not made in full within 14 days of receipt of the invoice, you may face a late payment charge (10% of the outstanding amount). Work can be cancelled by the client, up until the point of paying a deposit or prepayment without incurring any cost. Once a deposit has been paid, it cannot be refunded. Upon written or verbal cancellation of a project, the Client is responsible for payment for time already invested towards the completion of the project that exceeds the original 50% initial payment, if any, based on the stage of the project’s completion. Should the Client cancel the project following its completion, the Client remains responsible for full payment, as per the original estimate. While we aim to give our customers the utmost satisfaction, we understand that writing is not an exact science. Judgment and assessment can be subjective, and misunderstandings can happen. It is the Client’s responsibility to discuss such issues with Copeland Creative. After giving Copeland Creative an opportunity to address concerns – based on a reasonable and collaborative working relationship, and a minimum of two further drafts – if the Work that has been submitted does not meet client expectations, the contract can be cancelled. The only notice that is required by either party is an email giving an ‘instruction to cease work’. This is entirely without prejudice, and no liability or admission of failure or inability to complete the contract on Copeland Creative’s part is implied. Any work that has been created up until that point will be paid for by the Client, whether approved or not. After work costs for the time spent have been deducted, any remaining balance will be reimbursed back to the client. The Client owns the work that has been created and submitted, provided it has been paid for. (h) Distribute any database that contains or incorporates any part of this Website or Content. YOU ACKNOWLEDGE AND EXPRESSLY AGREE THAT USE OF THIS WEBSITE IS AT YOUR OWN RISK. NEITHER COPELAND CREATIVE, NOR ANY OF ITS EMPLOYEES, AGENTS, CONTENT PROVIDERS OR LICENSORS, MAKES ANY REPRESENTATIONS OR WARRANTIES, EXPRESS OR IMPLIED, OF ANY KIND REGARDING THIS WEBSITE, THE CONTENT, ANY ADVERTISING MATERIAL, OR THE RESULTS THAT MAY BE OBTAINED FROM USE OF THIS WEBSITE. TO THE FULL EXTENT NOT PROHIBITED BY LAW, THE CONTENT IS PROVIDED TO YOU ON AN “AS IS” AND “AS AVAILABLE” BASIS FOR YOUR INTERNAL INFORMATIONAL USE ONLY, WITHOUT ANY REPRESENTATION, CONDITION OR WARRANTY, INCLUDING OF ACCURACY OR COMPLETENESS OF INFORMATION OR OTHER WARRANTY OR CONDITION OF ANY KIND, INCLUDING ANY IMPLIED WARRANTY OR CONDITION OF QUALITY, MERCHANTABILITY, MERCHANTABLE QUALITY, FITNESS FOR A PARTICULAR PURPOSE, OR NON-INFRINGEMENT. COPELAND CREATIVE WILL NOT BE LIABLE IN ANY RESPECT TO YOU OR TO ANY THIRD PARTY THAT MAY RECEIVE CONTENT FROM THIS WEBSITE, INCLUDING FOR ANY DELAYS, INACCURACIES, ERRORS OR OMISSIONS IN THE CONTENT OR IN THE TRANSMISSION OR FAILURE TO TRANSMIT ANY CONTENT, IN WHOLE OR IN PART. TO THE FULL EXTENT NOT PROHIBITED BY LAW, IN NO EVENT WILL COPELAND CREATIVE BE LIABLE TO ANY PARTY FOR ANY DIRECT, INDIRECT, INCIDENTAL, SPECIAL, PUNITIVE OR CONSEQUENTIAL DAMAGES RESULTING FROM OR CAUSED BY A PARTY’S USE OR INABILITY TO USE THIS WEBSITE OR A PARTY’S RELIANCE ON ANY INFORMATION OR MATERIAL ACCESSED VIA THIS WEBSITE OR ANY OTHER HYPERLINKED WEBSITE. The material on this Website may contain technical inaccuracies or typographical errors, and information may be changed, updated or deleted with or without notice. Copeland Creative may make improvements and/or changes to the Content of this Website at any time. Copeland Creative makes no warranties that this Website will operate uninterrupted or error free, or that defects will be corrected. Copeland Creative does not warrant that this Website is compatible with your computer equipment or that this Website or its server is free of errors or viruses, worms or “Trojan horses” and Copeland Creative is not liable for any damage you may suffer as a result of such destructive features. You additionally acknowledge that this Website, and your access thereto may be subject to limitations, delays, and other problems inherent in the use of the Internet and electronic communications. Copeland Creative is not responsible for any delays, delivery failures, or other damage resulting from such problems. 15. Copeland Creative and its licensors make no representation, warranty, or guaranty as to the reliability, timeliness, quality, suitability, truth, availability, accuracy or completeness of the Site or of any Content. Copeland Creative does not endorse any websites that are or may be linked through this Website. Copeland Creative may provide such links to you only as a matter of convenience, and in no event shall Copeland Creative or its licensors be responsible for any content, products, or other materials on or available from such sites. Copeland Creative makes no representations or warranties whatsoever about any other website that you may choose to access through this Website. Links provided by Copeland Creative to such websites are provided solely for your convenience; such links do not constitute Copeland Creative’s endorsement or approval of any other website or its content, and should not be relied on as such. You hereby acknowledge and agree that you have requested that this agreement and any related communication between Copeland Creative and you be drawn up in the English language. Les parties aux présentes reconnaissent qu’elles ont exigé que la présente convention et tout document relié soit rédigés en Anglais. Nobody Cares About Your Story Until You Win. So Win!